Is There a Penalty If I Dont Have Health Insurance? The post Is There a Penalty If I Don’t Have Health Insurance? appeared first on amnationalins.com. Insurance Company Denied My Claim Now What? The post Insurance Company Denied My Claim Now What? appeared first on amnationalins.com. The post How to Choose an Insurance Broker appeared first on amnationalins.com. Just about every day I'm answering questions and giving advise to people about insurance. Today we are going to talk about how to find a good insurance agent. According to the California Department of Insurance, more than 50% of consumers ranked someone they trust as the most important criteria When selecting insurance agent. So how can you find someone that you know you can trust if you don't already know an insurance broker to begin with? Well, first you want to find an insurance broker that specializes in the type of insurance you are looking for. I would avoid going to an insurance broker that sells a little bit of everything, because they're probably not good with all types of insurance. They may be good with one or two types of insurance, but probably not good with everything. I would also want to work with an independent agent. There are two types of agents. One is whats known as a captive agent, and the other is an independent agent. A captive agent only works for one company and only offers that particular company's products. While an independent agent will have a number of different companies that they work with and can offer you multiple choices depending on your needs. Third, its a good idea to contact a several agents. You will know if he or she is a good agent because they will likely ask you a lot of questions. And the more questions they ask, the better the agent they probably are. The more information they have about you and your insurance needs, the more they will be able to help you. So be sure to give them as detailed answers as possible. Then finally get a quote from the agent you select for whatever type of insurance you are looking to buy. Out of all the agents you talk to, usually the one that stands out as the one you feel most comfortable with will probably be the right choice for you. The post Car Insurance Compared to Other Expenses appeared first on amnationalins.com. Most people would agree that car insurance is a big expense. With so many advertisements everywhere trying to convince you to save money on car insurance, you would think its one of the bigger expenses. 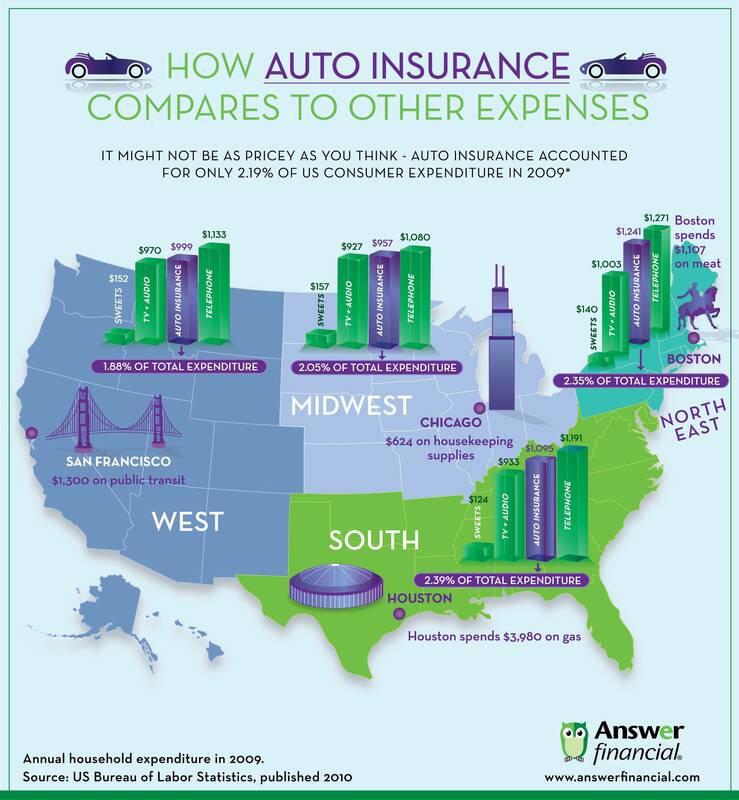 However, a study by the US Bureau of Labor Statistics shows that for overall United States consumer expenses, Auto insurance only accounted for 2.19%. This is actually less than less than telephone expenses for most. We found a great info graphic below from Answer Financial that compares what people spend on different things including how much people spend on public transit in San Francisco, gas in Houston, Housekeeping supplies in Chicago, and meat in Boston. You can also see how much is spent on TV, telephone, and insurance costs in all areas. Its actually pretty surprising how small of an expenditure auto insurance is compared to other common household expenses. Don't forget to subscribe to our Insurance Blog for updates! Republican lawmakers are moving quickly to repeal the healthcare reform law known as Obamacare, but Congressman Chris Collins, R-N.Y., has said Americans should not be worried about immediate changes to their insurance plans. Collins, the Congressional Liaison to President-elect Donald Trump's transition team, told MSNBC's "Morning Joe" on Thursday that new plans would not be available until "2019 or later." "Immediately, what we're saying, is we're not going to pull the rug out from under anyone," Collins said. "There's not going to be any changes in 2017. There's not going to be changes in 2018." He added, "Those products have already been approved by the state insurance agencies, or for the 2018 time, are in negotiation right now." However, Collins indicated the GOP's plan to repeal the law using the reconciliation process could affect Obamacare-related taxes as well as the insurance mandates for individuals and companies with more than 50 employees. Hello, I'm Kristina Douglas, CEO and founder of this insurance blog. I've been working in an insurance company for couple of years, then I started this blog to share all of my experience with my readers. Stay connected for latest updates about insurance, tips and tricks and much more.